Here are ten reasons that an epoxy or acrylic will not bond or will blister after being applied on a pool restoration or resurfacing project. These come from the Newlander Testing Facility in Florida. 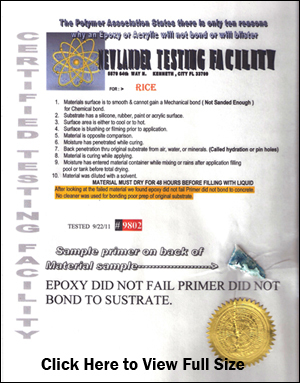 The you can see the full certified testing facility document in the pool coating failure pdf when you click the picture. Using our Ultraguard product and our high bond strength coating will eliminate these potential issues for pool coating failure. Substrate is too smooth and cannot attain the initial mechanical bond needed to create the chemical bond. When you purchase our Ultraguard product, we will walk you through the entire installation of our product, every step of the way. Just fill out our questionnaire to get started on restoring your pool to its former glory.